Each year, generous philanthropists support Houston Methodist’s research, education and patient care initiatives. These gifts play an important role in advancing our leading medicine mission. Establishing Houston Methodist’s internal medicine scholars program was a natural fit for Anne and Charles Duncan. Charles is a Life Member of the Houston Methodist board, in recognition of nearly 25 years of service, a member of the Houston Methodist Hospital Foundation board, and the Duncans are longstanding supporters of health care and higher education on many fronts. In fact, the Duncans were among the first to fund education at Houston Methodist, endowing the Charles and Anne Duncan Presidential Distinguished Chair in Medicine. Dr. Richard J. Robbins, who holds that position, oversees the scholars program and encouraged the Duncans to participate. Designed to prepare physician-scientists to become the next leaders in internal medicine, the scholars program trains new physicians in specialty and sub-specialty areas. Since its inception in 2011, 14 medical residents have been honored with the coveted title of Duncan Scholar. “We support the scholars program as a function of Dr. Robbins’ work,” says Charles. “It’s an extension of our interest in education in general, and medical education, specifically,” adds Anne. “We are excited about the future of this program.” The couple meets annually with the impressive Duncan Scholar awardees. “They come from all over the world,” says Charles. “They are the cream of the crop, the brightest and best, and they are all passionate and enthusiastic about their work. In 2011, a minor accident landed Ralph O’Connor at Houston Methodist under the care of orthopedic surgeon Dr. William “Bill” Bryan. While Ralph recovered, Dr. Bryan introduced him to Dr. Marc Boom, who at that time had not yet taken on the CEO role at Houston Methodist. Later, Ralph inquired about giving opportunities in appreciation of the wonderful care he received. On learning of Dr. Boom’s impending promotion, Ralph hatched plans for a memorable philanthropic contribution. On Dr. Boom’s first day as CEO, there was a personal letter and a signed check from the O’Connors on his desk. “The hospital staff could not have done a better job in taking care of us,” says Ralph. “It’s natural to want to help someone who has helped you.” In subsequent conversations, the O’Connors learned the Houston Methodist Community Scholars Program was a top priority for Dr. Boom. “We are delighted to help doctors get excellent training right here in Houston,” says Ralph. “We know these current scholars will teach the next generation. So we’re not just helping one person; we will help a lot of people.” The O’Connor’s support will help expand the program into areas beyond nephrology, neurology and endocrinology. Houston Methodist nurses exemplify the institution’s I CARE values of integrity, compassion, accountability, respect and excellence. Through outstanding leadership, an exemplary nurse can amplify the ripple effect of these values, serving as a model for his or her entire team. Houston Methodist places these nurses in the spotlight with two annual accolades. THE OUTSTANDING NURSING AWARD is another annual Houston Methodist honor. The prestigious award recognizes a truly outstanding nurse who consistently demonstrates excellence in nursing practice, professional development and dedication to patients. The Outstanding Nursing Award is made possible by a generous grant from The Brown Foundation, Inc. A nurse must be nominated and meet an extensive list of requirements to qualify. By aiding in the development of leadership skills among nurses and by rewarding those who excel, Houston Methodist seeks to advance the level of patient care while also attracting the best and brightest nurses in the nation. In a magical space that has seen many remarkable moments, an especially important one took place last December. The applause resonated through Houston Methodist Hospital's Crain Garden when President and CEO Dr. Marc Boom announced that, thanks to The Alkek and Williams Foundation, the Margaret Alkek Williams Crain Garden Performance Series would be sustained in perpetuity ensuring that the arts would be permanently woven into the fabric of the Houston Methodist experience. Additionally, the generous support will expand the integration of arts and medicine throughout the Houston Methodist system. For 20 years, the Center for Performing Arts Medicine has worked to give Houston Methodist patients the therapeutic benefits of the arts and to advance the role of the arts in medicine. The centerpiece of these efforts is the Crain Garden Performance Series. 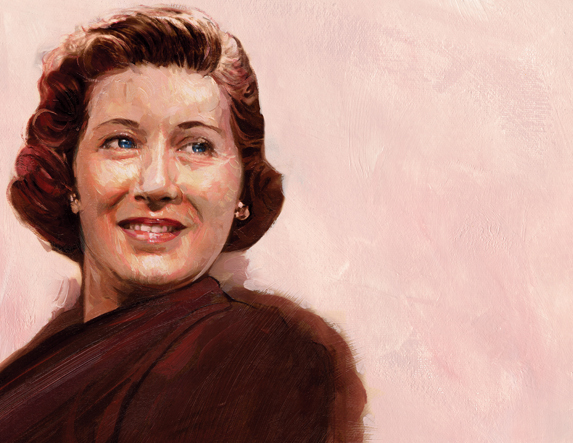 Today, Margaret carries on this legacy at Houston Methodist through this unique collaboration between the arts and medicine. This gift and announcement were made shortly before the retirement of Dr. C. Richard Stasney who began the Houston Methodist Center for Performing Arts Medicine more than 20 years ago as the nation's first institutionally backed center specializing in the healing of performers in the arts. Under the direction of Dr. Robert Jackson and Todd Frazier, the Center continues to lead groundbreaking research, to develop arts therapy and to provide health care and education to artists and the community. Claud B. Hamill loved the oil business and became a successful independent oilman. He and his wife Marie also loved Houston and were generous with their philanthropy during their lifetimes. Today, Houston continues to be the beneficiary. They created The Hamill Foundation in 1969 following the untimely death of their only child, Garrett, as a means to continue their philanthropy. Since that time, the enduring Hamill Foundation has given away millions of dollars - more than $106 million since the Foundation was fully established in 2000. Thanks to prudent financial management by The Hamill Foundation's board - with directors who are more like family than employees - the Foundation's assets have grown to become the 10th largest foundation in Houston. In 2015 alone, the Foundation awarded $10.5 million in grants to more than 115 Houston organizations, including Houston Methodist. 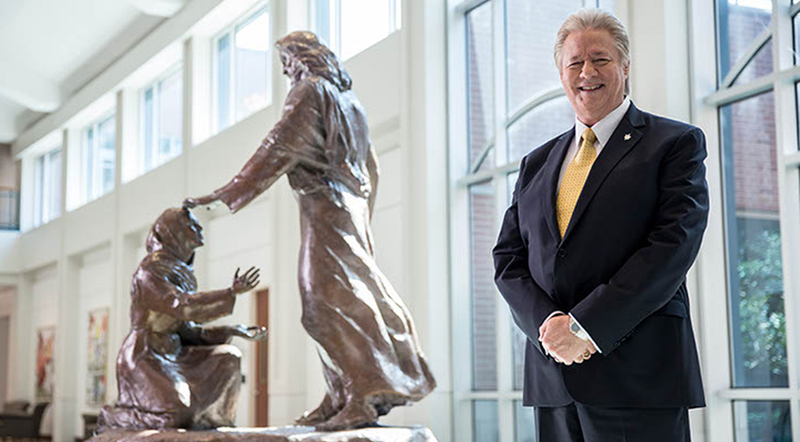 The Hamill Foundation's most recent gift includes $2 million to create the Houston Methodist Men's Comprehensive Health Initiative under the direction of Dr. Brian J. Miles, and $300,000 to continue its support of Dr. Stanley Appel's research into neurodegenerative diseases. Dr. Miles says. "Our center for men's health is one of the first ports of entry for men and will allow them to avail themselves of many health opportunities.” Men will have access to testosterone replacement therapy and the latest technologies and treatments for prostate cancer, but they will also receive facilitated access to heart care, wellness services, and have opportunities to participate in clinical trials. The Hamills' generosity and love for Houston have touched every corner of the city and surrounding region, funding educational, religious, scientific and charitable causes of all kinds. The Hamills were very generous during their lives, but Mr. Hamill always said, '"During my lifetime, I'm going to build this up, and then you boys can give it all away,'" recalls Tom, who started working in Mr. Hamill's oil company in 1979. Mr. Hamill was born into the oil industry. His father and uncles drilled the Lucas gusher at Spindletop in 1901, giving rise to the modern day petroleum industry. The young Claud grew up in Bay City and began work as a toolpusher on his father's drilling rig. But his dream was to be an oilman in his own right. Ultimately, he became one of the most respected oilmen of his time, known for avoiding debt, paying his bills in a timely manner and working behind the scenes to give back to the Houston community. He and Marie Garrett were introduced by family members while vacationing in Mineral Wells, according to the history of The Hamill Foundation published in 2001. As Mr. Hamill's career broadened beyond just drilling to oil exploration, the Ham ills, both with rural roots, chose Houston as their home and embraced it whole­heartedly. They built one of the first homes on River Oaks Boulevard, complete with a swimming pool, which was rare for the time. The Hamills were known for their sense of fashion and for their civic and community leadership, although it was always low-key and out of the media spotlight. Mr. Hamill was like "a quiet giant,” Tom explains. One of the couple's few high-profile projects involved leadership of the war bond drive to build the second cruiser USS Houston. The original cruiser was lost in World War II. Newspaper photos of the day show Mrs. Hamill christening the new ship. The Hamill Foundation directors have rich and fond memories of the couple. Mr. Hamill lived until the age of 86, coming into the office up until his death in 1986. He served on the Houston Methodist board from 1941 to 1949 and made his single largest personal gift to help establish the transplant center. Mrs. Hamill lived nine years after her husband died, remaining "a grand and gracious lady" until her death in 1995 at age 91, Tom says. She was so appreciative of the care they both received on Fondren 12 that she bequeathed her Dorothy Doughty collection of high-quality porcelain bird replicas to Houston Methodist Hospital, where they are still displayed. 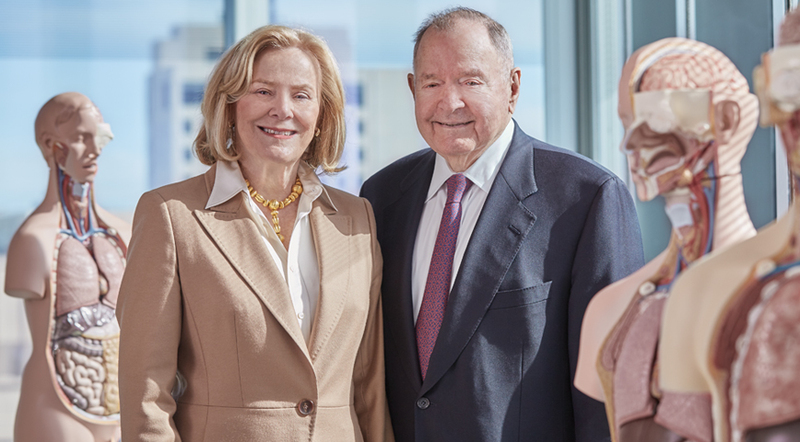 As much as the Hamills avoided the limelight in life, the foundation they created has become one of Houston's largest and most recognized for supporting a broad variety of causes. Thanks to Marie and Claud Hamill's generosity and careful planning, their Foundation continues to give back to the Houston community. Over the course of four decades (1974- present), Mr. and Mrs. Hamill and The Hamill Foundation have provided more than $6.1 million in cash and in-kind support to Houston Methodist, including a $500,000 gift in 1984 to launch Houston Methodist's organ transplantation center. Dr. Mary Neal and Ron Neal were touring the Houston Methodist Cancer Center when they heard something that astonished them. Cancer Center Director Dr. Jenny Chang, Emily Herrmann Chair in Cancer Research, spoke about getting new treatments to patients faster - and sharing her research with others. "What sparked our interest was her desire to share her research findings and make them available to everyone," Ron says. "That is truly unique." The Neals' initial interaction with Dr. Chang spurred their most recent gift to Houston Methodist in support of cancer immunotherapy research. The Neals have seen how competition for funding can encourage researchers to keep their findings to themselves. But Dr. Chang has a different philosophy, they say. “Dr. Chang feels that if anyone has information that could save a life and heal an illness, it should be made available to everyone,” Mary says. Louisiana natives and Louisiana State University graduates, the Neals relocated to Houston in 1979. Ron is co-founder and co-owner of Houston Energy, L.P. Mary, who completed her medical residency with Baylor College of Medicine, was affiliated with The Woman's Hospital of Texas before retiring from private practice after 25 years. She now volunteers with San Jose Clinic, a health care provider for underserved communities and partner of Houston Methodist for more than 20 years. Through the Neals' generous cancer immunotherapy research gift, Dr. Chang's team is exploring methods to encourage the body's immune system to battle cancer cells without the harmful side effects that typically result from traditional cancer treatments like radiation and chemotherapy. The Neals chose to support the cancer immunotherapy research program because they believe it’s the most effective approach to cancer treatment. Mary has seen firsthand how difficult and damaging these traditional therapies can be for patients. She has also, however, witnessed the success of immunotherapy. "I know someone who went through immunotherapy,” she says. "Seven years later, he is cancer-free and hiking the Grand Canyon. So I ask, if your immune system can control cancer cells, why wouldn't your immune system be able to cure cancer?" The Neals also believe in Houston Methodist as a whole. They have given to other initiatives supported by friends and colleagues Billy Harrison and Rusty Walter, including the Nantz National Alzheimer Center and the Emily Herrmann Chair in Cancer Research. "We definitely agree with Houston Methodist's slogan of ‘Leading Medicine’ and we believe in President and CEO Dr. Marc Boom and his leadership," says Ron. "An organization's leadership makes a great difference in what we support, and with Drs. Boom and Chang together, we think it's a safe bet that they will accomplish so much. From the time Emily Herrmann was diagnosed with breast cancer in 1998, she quietly dedicated herself to helping others with cancer. Her legacy of hope lives on at Houston Methodist as the Emily Herrmann Cancer Research Laboratory continues its groundbreaking translational research and innovative patient treatments. Six years after Emily’s death, her family, friends and former workplace colleagues at Walter Oil & Gas gathered at the research lab in December 2013 to celebrate her life and launch another fundraising initiative to establish the Emily Herrmann Chair in Cancer Research. The new chair will recognize a distinguished cancer researcher, support the latest in medical education through visiting lectureships, provide seed funds for innovative research projects and further strengthen the momentum toward discovering new medications, treatments and cures. 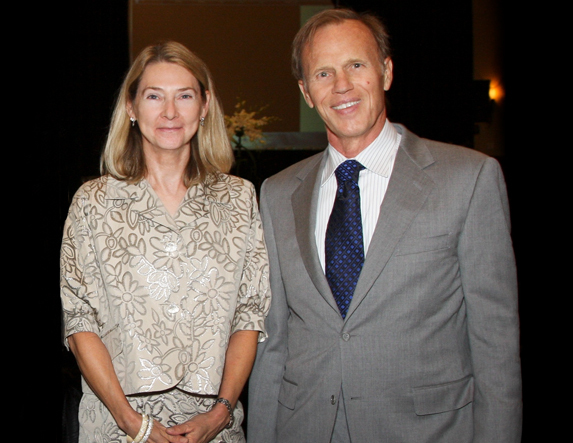 “I have no doubt that the breakthrough research taking place at Houston Methodist will lead to advances in cancer therapy,” says Joseph C. “Rusty” Walter, Emily Herrmann’s close friend and the generous benefactor whose company helped create the Emily Herrmann Cancer Research Laboratory at Houston Methodist shortly before her death. “I am hopeful that these advances will eventually lead to a cure for a disease that claims so many lives each year,” says Rusty. The lab opened in 2011 thanks to a generous gift from Walter Oil & Gas and through the largess of Rusty Walter and his sister, Carole Walter Looke. Emily Herrmann worked for Walter Oil & Gas for 20 years, and as treasurer and controller was a strong force in the company’s growth and success. Rusty Walter challenged others at the lab’s opening to join in advancing cancer research, and Walter Oil & Gas pledged to match any gifts, dollar for dollar, to fund high-impact research projects. This initial effort far surpassed expectations, raising $350,000 that was used as seed funding for innovative projects, all with the potential to yield significant results in the battle against cancer. Led by internationally acclaimed oncologist Dr. Jenny Chang, the lab’s research team is pioneering new treatment protocols and investigating potential cures. Projects include an implantable drug delivery system for breast cancer prevention therapy, an insertion of “suicide” genes against breast cancer stem cells using photothermal nanoblades and utilization of state-of-the-art microfluidics technology to prevent triple negative breast cancer metastasis. Rusty Walter and his wife Paula, along with Ann and Frank W. “Billy” Harrison and Carole and Jim Looke, pledged $500,000 in matching gifts for this latest initiative to create the Emily Herrmann Chair in Cancer Research. It is the next big step in developing the research laboratory and breakthroughs in cancer care. As she had done for years, in 2012, Vicki Baucum scheduled her annual mammogram for early October. When her doctor, Keith Reeves, requested she undergo additional testing, she hardly gave it a second thought. “I have dense breast tissue, so additional testing was not uncommon,” she says. But just because a test is routine, it doesn’t mean the results will be predictable. A week before Thanksgiving, Dr. Reeves delivered life-altering news to Vicki and her husband Carl: The additional tests revealed she had a malignant tumor. The diagnosis launched them on a 10-month journey underpinned by faith and trust. Dr. Reeves, now retired and the former chair of Houston Methodist’s Center for Restorative Pelvic Medicine, immediately arranged for Vicki to meet the next day with Dr. Jenny Chang, director of the Houston Methodist Cancer Center and holder of the Emily Herrmann Chair for Cancer Research. “Dr. Reeves told me, ‘Whatever she tells you to do, you do; she knows more about breast cancer than anyone, so trust her completely.’ And, that’s what I did,” Vicki says. As with her diagnosis, Vicki’s treatment plan came together very fast. The following week, she underwent a battery of tests as Dr. Chang collaborated with a team of expert colleagues from Houston Methodist and around the world to create a unique and tailored treatment regimen, which would include chemotherapy, surgery and radiation. Dr. Chang recommended chemotherapy first, thereby allowing her to study the effects of the chemo on the tumor. Triple-negative breast cancer accounts for only 15 percent of breast cancer cases, and the disease does not respond to therapies targeting the three receptors known to cause the majority of breast cancers. Vicki became part of a clinical trial using a taxane-based chemo. After four infusions, the tumor had nearly doubled in size. “Triple-negative breast cancer is difficult to control,” Dr. Chang explains. “Unlike other cancers, we don’t know what causes it. It’s genetically unstable, so the treatment is not targeted – instead there are multiple targets that must be treated.” Dr. Chang then started Vicki on a combination chemotherapy called AC, which required an infusion every three weeks. During this time, Dr. Chang received results of a genetic analysis she ordered, and it revealed that Vicki’s tumor was made up of not one, but two different mutated genes. Armed with this additional information, Dr. Chang and her colleagues again tweaked Vicki’s treatment and supplemented the AC infusions with weekly infusions of the targeted blocker EGFR, which specifically targeted one of Vicki’s two mutated genes. Vicki and Carl’s confidence in Dr. Chang never wavered. Never were they surprised when she would suggest additional ways to attack Vicki’s most unusual cancer. So, when Dr. Chang recommended adding another type of chemo infusion, coupled with a daily targeted blocker in pill form, there was no hesitation. The couple agreed. The revised regimen quickly improved Vicki’s prognosis. 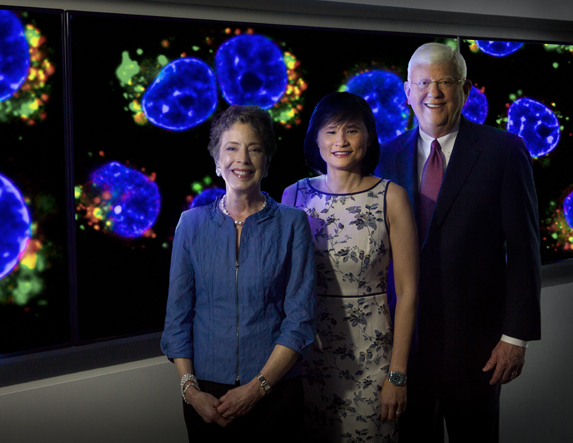 By May 2013, the tumor shrunk to less than its original size, providing the ideal circumstances for Dr. Barbara Bass, John F., Jr. and Carolyn Bookout Presidential Distinguished Chair, to remove what was left. In all, during a 10-month period, Vicki received 28 infusions, participated in a clinical trial, underwent surgery and had 33 rounds of radiation. She and her husband also formed lifelong bonds with Dr. Chang and many others at Houston Methodist. Grateful and appreciative of the care they received, Vicki and Carl considered ways to show their thankfulness. Most particularly they wanted to support Dr. Chang and her research. Their decision was made after learning about CREDO: The Center for drug REpositioning and DevelOpment. Many of the drugs approved by the FDA for other uses may hold promise for the treatment of breast cancer. But a program has never existed to test their effectiveness on this disease. CREDO fills this void. By repositioning existing approved drugs, researchers will avoid significant costs and the decades-long discovery process, ultimately providing faster treatment to patients. This leading medicine research has the potential to transform the treatment of breast cancer patients. The Baucums gave a dollar-for-dollar match in support of CREDO program fundraising. At the time of publication, they had raised more than $300,000. An example of the type of promising drug repositioning opportunities available includes the discovery of a new molecule that was tested as a post-heart attack treatment. While the drug failed in its intended heart therapy purpose, preliminary findings in patient-derived animal models show that it may provide a novel approach to overcoming treatment-resistant triple-negative breast cancer. Currently, no targeted treatment exists for this aggressive form of breast cancer. “Cancer care is more science than art, but you need to be able to provide the most effective treatment and encourage new findings in treatment and research while having the ability to help patients and their families through a difficult time,” Dr. Chang says. The Baucums, she says, showed amazing strength and courage throughout, and Vicki endured her rigorous treatment with great stoicism. Vicki says, “A very important ingredient in this process is having faith in God, your doctors and yourself. Triple-negative breast cancer is a disease the world doesn’t really know much about. Dr. Jenny Chang’s pioneering work has helped transform triple-negative breast cancer research, providing hope for those diagnosed with this aggressive disease. 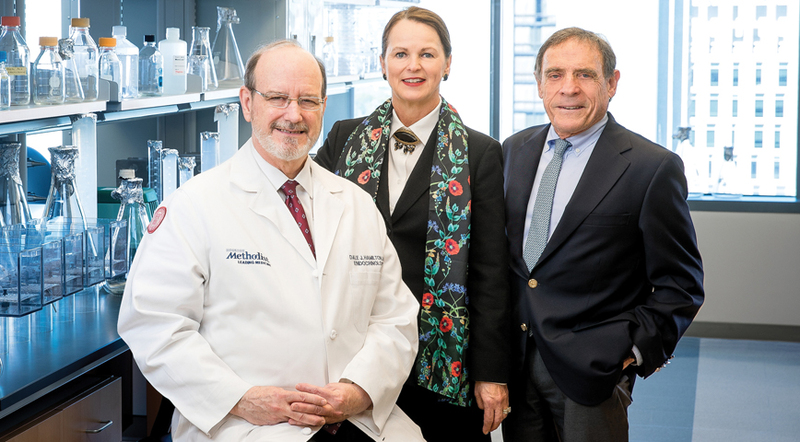 The new George and Angelina Kostas Research Center for Cardiovascular Nanomedicine at the Houston Methodist Research Institute began operations recently after receiving a generous gift from George J. and Angelina P. Kostas. The gift is the largest philanthropic gift ever given in support of cardiovascular nanomedicine and could revolutionize the treatment of cardiovascular disease. The groundbreaking center will foster international collaboration and bring together top laboratory and physician-scientists from the Houston Methodist DeBakey Heart & Vascular Center and the Houston Methodist Research Institute Department of Nanomedicine. The objective is to apply nanotechnology to the cardiovascular system to remove normally occurring stenosis without the need of surgery. This gift will fund an international annual meeting in Houston on cardiovascular nanomedicine that involves scientists worldwide in order to serve as a platform for the exchange of ideas. The Kostases, American-born children of Greek immigrants, have a long tradition of philanthropic gifts, including establishment of The George J. Kostas Research Institute for Homeland Security (2010) and The George J. Kostas Nanoscale Technology and Manufacturing Research Center at Northeastern University (2003) in Boston, George Kostas’ alma mater. The George J. Kostas Research Institute for Homeland Security is a secure building at Northeastern University, Burlington Campus. Its mission is to conduct classified research to protect Americans in the face of 21st-century risks. In 2008 Northeastern awarded him an honorary Doctorate of Sciences and the President’s Medallion award. After his retirement from Conoco in 1972, where he was manager of the Organometallics Division, he founded and has been president of TESCO (Techno Economic Services Inc.) for 30 years. Under his leadership, TESCO developed a revolutionary new process, based on his patents, termed “Xenoclad,” which plates aluminum in an atomic form on metal substrates to render them resistant to corrosion. George Kostas was recruited in 1943, along with seven other engineers, to start and operate the first U.S. synthetic rubber manufacturing plant which was already being built in Baytown, Texas. In 1946, Kostas was appointed a member of the U.S. Research & Development Committee and served in this capacity until 1955 when the government decided to exit the synthetic rubber program. Angelina, “Lea,” a woman of deep faith, grace and warmth, and devoted lifelong member of Annunciation Greek Orthodox Cathedral, served as a member of the Philoptochos charitable society for 70 years, and board member for 40 years. During World War II, Lea served as a spotter for enemy aircraft over the Houston area. Married for 62 years, George and Angelina are the parents of four talented daughters. The Kostas family has been generous supporters of the Annunciation and St. Basil’s Greek Orthodox Churches of Houston. They built the St. George Chapel and then donated it to the cathedral. St. Basil’s church honored Mr. Kostas by naming the education center in his honor. In 2008, they honored Lea Kostas by naming the auditorium in her honor. 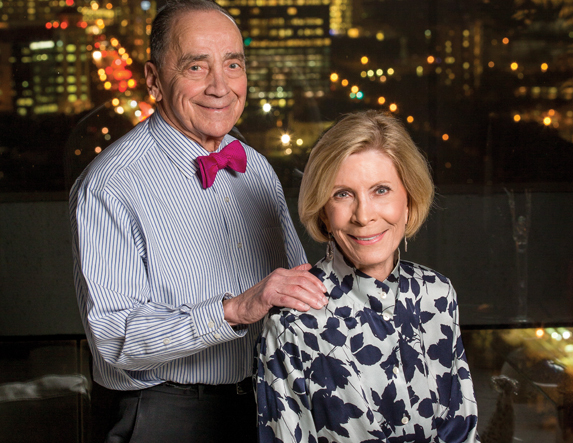 In the philanthropic spirit that defines their family, Angelina and George Kostas gave a generous gift to Houston Methodist in 2014 to create a center dedicated to advancing nanomedicine and revolutionizing the treatment of cardiovascular disease. The Kostas Center will be directed by Houston Methodist Research Institute President & CEO Mauro Ferrari, PhD, and Houston Methodist DeBakey Heart & Vascular Center Medical Director Alan B. Lumsden, MD, who, along with the executive committee, will guide the center’s development, approve new research initiatives and initiate collaborative ventures that will transform cardiovascular nanomedicine. The center’s program and working group leaders include some of Houston Methodist’s best nanotechnology researchers and cardiovascular physicians and surgeons, such as Guillermo TorreAmione, MD, PhD, Elvin Blanco, PhD, Miguel Valderrábano, MD, John Cooke, MD, PhD, Ennio Tasciotti, PhD, William Zoghbi, MD, and Paolo Decuzzi, PhD. The groups are designed to work in sequence, a bit like runners in a relay race, to translate discoveries quickly into technologies for human clinical trials. One possible area of investigation is the use of nontoxic, silicon-based nanoparticles to dismantle and disperse the fatty plaques that often form along the inner sides of blood vessels. These plaques contribute to hypertension. When larger plaques are dislodged, they can cause blockages downstream, leading to heart attacks and strokes. John L. Hern knew what it meant to need help. In 1996, Hern was a patient at Houston Methodist waiting for a heart transplant. Waiting on the chance that someone, somewhere, had made the selfless decision to be an organ donor. Waiting for an organ that could be a match. There were others waiting with him at the hospital. Always a gregarious person, Hern made friends with his fellow patients and their families. Hearing their stories, he learned of the enormous pressure that many of his fellow patients were under. Near the end of the year, Hern did receive a transplant. It was successful, but almost one year later his antirejection medication failed. In October 1997 he passed away. After his passing, John’s friends and family established the JLH Foundation in his memory. From the beginning, they were clear on the purpose of the Foundation: to fulfill John’s wish. The JLH Foundation began its philanthropic mission with a focus on helping heart transplant patients. In 2004, the JLH Foundation broadened the scope of its assistance to include all types of transplant, and established the John L. Hern Fund for Transplant Patients and Their Families at Houston Methodist. “We’ve been able to help patients get their medication,” says Paula, describing the work of the Hern Fund at Houston Methodist. “We’ve helped with lodging… we’ve helped with food, we’ve helped with parking. That’s what we’re wanting to do, help with these direct needs, these concrete needs that people have.” Since 2002, the JLH Foundation has contributed over $1.7 million to Houston Methodist, including a $600,000 commitment made to the Hern Fund in 2014. The foundation has also provided generous support for the construction and operating costs of Nora’s Home, an affordable housing facility for transplant patients and their families receiving treatment in the Texas Medical Center. From the time he was 4 years old, Alan Conover was fascinated by trains. Every Sunday he and his father visited the railroad yard to watch, to listen and eventually, to ride. 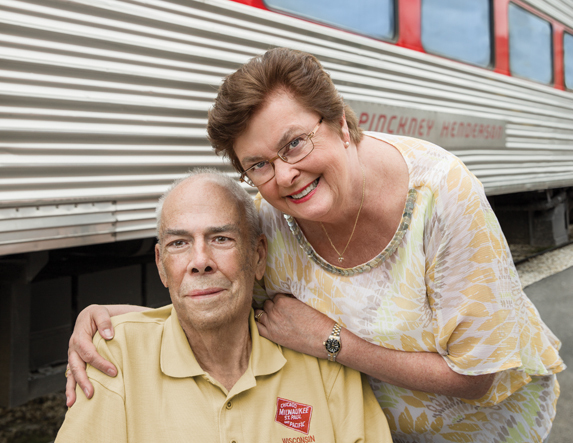 Decades later, as Alan continues his recovery and rehabilitation from a liver transplant, his heart is set on returning to his journeys aboard a historic rail car that he and his wife Sherrie restored. In the months following his May 23, 2013, liver transplant – performed by Drs. R. Mark Ghobrial and Howard Monsour in the J.C. Walter Jr. Transplant Center at Houston Methodist – Alan had two goals: get well enough to climb the rail car stairs and ride his train again; and give a generous bequest to Houston Methodist to help create the largest and best liver center in the nation. Within two years of receiving his new lifesaving liver, he accomplished both goals. In April 2015, Alan and Sherrie – along with Dr. Ghobrial and his wife Kathy, Dr. Marc Boom and his wife Dr. Julie Boom, and Alan’s nephew Ed Jones, chief operating officer of the Houston Methodist Research Institute – took the J. Pinckney Henderson on a Houston-to-San Antonio train tour. Named after Texas’ first governor and called The Texas Special for its original route from St. Louis to San Antonio, the historic train attracted railroad enthusiasts all along the route. Made of stainless steel and the only rail car that was part of Amtrak’s experimental luxury service, this was The Texas Special’s first return trip since the original route ended in 1959. Although still weak and 150 pounds lighter than before his liver began failing, Alan was back on track, his wife of 32 years by his side as they visited with guests and cherished the ride. The following June, they returned to Houston Methodist for a formal dedication of the Sherrie and Alan Conover Center for Liver Disease & Transplantation. The couple decided to give what they have – not just what they could. Their transformational $6.5 million commitment – a blended gift of current use and a bequest, and the first named center at Houston Methodist from generous benefactors from a state other than Texas – will provide resources for groundbreaking research to help more liver patients get the lifesaving treatments they need. Alan and Sherrie have lived in Florida since retiring in the 1980s. He worked as a fireman in New York’s Hudson Valley for 20 years, and Sherrie was a reading specialist in the Newburgh, NY, school district. Their lives in retirement were packed with full-time adventure. Alan pursued his passion for trains with gusto, and the couple restored two historic train cars. They hosted their friends on rail trips all over the country, including a memorable rail trip to the Kentucky Derby. Life was full and good. About four years ago, Alan’s lungs started collecting fluid. He couldn’t catch his breath and within a very short time, this generally healthy, active man became critically ill. His Florida doctors blamed the fluid buildup on a failing liver. And since Alan was over 70, doctors there told him he was too old for surgery and there was nothing they could do but drain the fluid periodically. The Conovers weren’t willing to settle for a compromised life if there was hope. “I called Ed and asked, ‘What are we going to do about your Uncle Alan?’” Sherrie recalls. Jones immediately reached out to Dr. Monsour. Houston Methodist’s collaborative environment was critical to Alan’s post-transplant recovery. He suffered complications with his heart, requiring two aortic valve surgeries. Dr. Michael Reardon, a cardiothoracic surgeon with the Houston Methodist DeBakey Heart & Vascular Center and a valve expert, performed the surgeries. The Conovers credit all three doctors and their teams with saving Alan’s life. Despite his illness, Alan keeps his sense of mischief about him and notices weekly improvement in his health. He proudly shows a photo of a much heavier Alan Conover patting a sleeping cheetah on a refuge in Africa. “That was me before I went on the Ghobrial diet. I don’t recommend it,” he says. Even when asked about the incredible and unexpected bequest, Alan responds that since they have no children, he didn’t really want to leave the money to his pets’ veterinarian when he passes. He has great one-liners and likes to make people laugh. But he and Sherrie also show a deep joy for the moment – a sincere appreciation for life that many people seem to overlook. “Each day as it comes,” Sherrie is fond of saying. They truly enjoy a delicious meal together, and they laugh a lot. They revel in the company of good friends and family, laughter and shared memories. Most of all, they love to board the J. Pinckney Henderson for their next journey together, letting their lives roll with the rhythm of the rails. In October 2015, the couples hosted a special luncheon featuring CBS Sports commentator and co-founder of the Nantz National Alzheimer Center, Jim Nantz, and developments in the field. During the event both the Chiles and Moores announced significant matching commitments. “We are so blessed to have the Nantz Center here in Houston,” says Jack. “This work is exciting and encouraging. These discoveries have the potential to transform Alzheimer’s care.” Following their gift announcement, the couples challenged their friends, colleagues and community leaders to lend their support as well. “My family has been personally touched by this disease. We hope getting more people involved will create momentum to advance treatments, further prevention and ultimately develop a cure,” says Debbie. Visit nantzfriends.org to support the Nantz National Alzheimer Center and join Nantz Friends. Sharon Sumner has spent her life caring for others. A wife, mother, grandmother, friend - she is many things to many people and has lived an abundant life. She loves the outdoors and learned to fly fish so she could accompany her husband Bill on fishing trips around the world. She nurtured her children to be kind and good Christians, taught to follow their parents' example of giving back to the Tomball community where they grew up and now raise their own families. Today, three years after being diagnosed with amyotrophic lateral sclerosis (ALS) at Houston Methodist Hospital, Sharon spends her days in a wheelchair, unable to talk, walk or eat, communicating solely with a smile or a flash of her eyes. As the devastating neurodegenerative disease that felled baseball hero Lou Gehrig continues to shrink her physical world, Sharon Sumner's other life, the life of spirit and soul, remains well-tended, valued and affirmed under the hopeful attention of her family, friends and Houston Methodist caregivers. The Sumner family considers Drs. Ericka Simpson, Stanley Appel, Venessa Holland and members of the ALS Clinic team as extended family. They gave a $1 million gift to create the Sumner Family Chair in Neuromuscular Research held by Dr. Simpson. "Their level of commitment to finding cures for these neurological diseases is amazing,” Bill says. He and son Wes and daughters Leigh Ann and Jenny follow the ALS Clinic's cardinal rules: Sharon can't lose weight, fall or suffer any type of trauma, and she must use a sleep apnea machine at night. Bill takes Sharon to movies with their grandchildren and to the grocery store. Right after the ALS diagnosis, they took several family trips - to the Holy Land, Alaska, Las Vegas and Disneyland. Knowing tough decisions are ahead, the family is prepared to make them together. "What's so special about my mom is that, even in the face of this disease, all she worried about was us," says Wes. "She has all the grace and dignity in the world. Setting up something in our mom's name is a way to honor her and help in the fight to cure ALS." The Center is unique in many ways. Cutting-edge researchers in nanotechnology, gene therapy, neuro-chemistry, stem cell technology and genetics are working side by side with world-class clinicians including neurosurgeons, neurologists, radiation oncologists, medical oncologists and rehabilitation specialists to provide personalized care for each and every patient. Thanks to the generosity of Kenneth and Donna Peak, the Center provides individualized care to patients with brain, spinal and pituitary tumors and other brain and pituitary disorders to develop personalized treatment never before thought possible. Kenneth Peak, a prominent and respected member of Houston’s oil community, had not been feeling like himself. A disciplined runner, he’d been bothered by weakness on one side of his body that was making it difficult for him to keep up his routine. He went to see Dr. David Baskin, vice chair and residency program director of Houston Methodist Hospital’s Department of Neurosurgery and a senior member of the Houston Methodist Research Institute. The diagnosis was not good; Peak had a very aggressive tumor called a glioblastoma that had spread throughout major portions of his brain. His survival would normally have been measured in days to weeks. After standard treatments failed, Dr. Baskin and his team explored additional novel technologies that are still in development. “In his case, it meant sending his tumor tissue to four major genetic laboratories to analyze the entire genetic makeup of the tumor. We then took every chemotherapy agent known to man, tested them to see what worked, then combined all this information to design a highly specialized treatment. At one point in time, we even used superselective microcatheters to deliver chemotherapy drugs directly into the brain’s blood vessels that were actually feeding the tumor at the stem of his brain,” Dr. Baskin explains. As a result of a number of treatments, Peak’s tumor shrank considerably over the course of the next several months, and he was able to remain mentally alert and physically functional. In the end, the best medical science available in the world could not save Kenneth Peak. He passed away in April 2013 at the age of 67. But before he died, he and Donna made a $10 million commitment to Houston Methodist to establish the Kenneth R. Peak Center for Brain and Pituitary Tumor Treatment and Research. The Peak center, which is already up and running, should move into a beautiful new location before the end of 2015. It will be housed in Houston Methodist’s state-ofthe-art outpatient facility and will collaborate extensively with the Houston Methodist Cancer Center, under the direction of world-renowned breast cancer researcher Dr. Jenny Chang. “Donna Peak was instrumental in this gift,” says Dr. Baskin, “because Mr. Peak looked to her to explain to him what was going on. He was a brilliant human being, and had an innate ability to grasp complex issues quickly. However, understanding neuroscience and tumor biology was like learning a foreign language to him, and Donna was his teacher. But Donna looked to him, too, to make major decisions all along the way. In keeping with Kenneth Peak’s wish for everyone to have access to the same kind of care he received at Houston Methodist, the Peak center will offer personalized neurosurgical and cancer treatment options. It will give patients access to novel research studies not available elsewhere. Investigational therapies include immunotherapy, nanosyringes for drug delivery, mitochondrial chemotherapy “smart bombs,” stem cells, gene therapy, genomic, proteonomic and DNA profiling, and high throughput screening of every tumor to determine the most effective course of treatment. In addition to tumors originating in the brain and spine, Dr. Baskin says the Peak center will focus on cancers that have metastasized to the brain (usually from the breast or lung), as well as pituitary tumors. While pituitary tumors are rarely malignant, they can cause blindness or other life-threatening disorders due to hormonal changes, if they go untreated. Dr. Baskin, who began his medical and research career at Baylor College of Medicine in 1984 and now is a professor of neurological surgery at Houston Methodist and the Weill Cornell Medical College, emphasized that Houston Methodist is covering all of the construction and operational costs, so that the gifts from the Peaks and other contributors will be devoted entirely to patient care and research. “Houston Methodist’s generosity is unusual in the medical world, where such gifts almost always have to support a portion of operational costs for the institution. Their willingness to cover construction and infrastructural costs leverages this gift and allows me to use all of these funds for what they were intended for, with the operation of the center supported by the hospital. For a man who spends his days getting inside people’s heads, literally, Dr. Baskin seems to have maintained the ability to not take himself too seriously. Among the weighted volumes of scientific research lining the shelves of his Scurlock Tower office is a thin book called Your Brain on Cubs, documenting the biochemical changes that apparently result from rooting for a team that has not won the World Series in more than 100 years. But he is not kidding when he expresses his profound appreciation and gratitude for the gift he and Houston Methodist have been given by Kenneth and Donna Peak. Few people know hospitals better than Kathy Hathorn Reichenthal. She and her late husband Jack co-founded American Art Resources in the 1980s, ultimately growing it into the premier international consulting firm for improving patients' hospital experiences through carefully selected, life-affirming artwork. Their design consulting has changed the face of hospitals in 47 states and several overseas countries, creating masterful displays of color and images that give patients comfort and ease stress. After Jack died of a glioblastoma in 2009, Kathy made it her mission to revitalize Houston Methodist Hospital's Main 8 where they spent so much time during his illness. In recent years, she worked with the couple's nationally known artist friends and clients to contribute art to Houston Methodist's Outpatient Center (OPC), collecting nearly 100 pieces valued at approximately $200,000. The reactions of patients, physicians and staff were heartwarming, she says. Kathy says her husband was passionate about everything he did, a champion for the rights of humankind and a man who never met a stranger. "Whatever time he had on Earth, he didn't waste a minute of it,” she says. Dr. Grossman says he will carry Jack's memory with him forever. And the remarkable gift dedicated to the memory of Jack Reichenthal and the work of Dr. Grossman provides Houston Methodist Hospital with a legacy of hope. ''Jack's life will remain with us as a reminder of what the human spirit can accomplish,” says Dr. Grossman. "He was an extraordinary individual and having my name associated with the chair that honors his memory is a privilege. For nearly four decades, Dr. Stanley H. Appel has dedicated his life to understanding neurological diseases and their devastating effects. 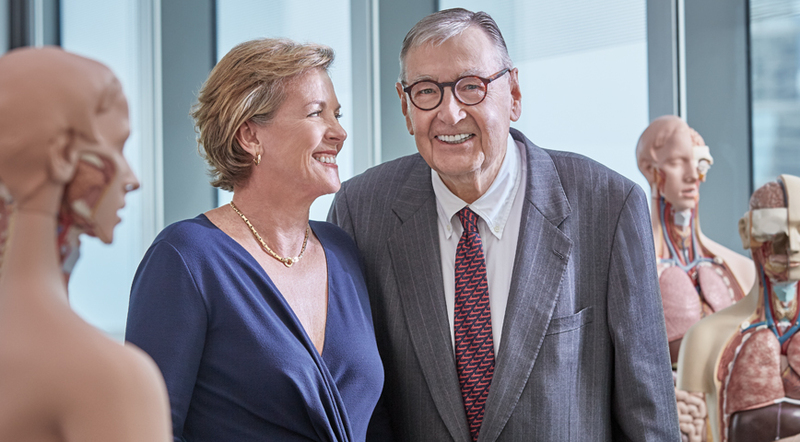 Now the Houston Methodist Department of Neurology that he has chaired so many years will bear his name and become the Stanley H. Appel Department of Neurology – thanks to an unprecedented and remarkable gift from the woman who has worked by his side for 18 years – his wife Joan. “His passion for his work and for his patients is incredible,” Joan says. “I thought it would be a wonderful thing to name the department after him. He is really loved.” Her gift was a sudden epiphany, providing a pathway to ensure that her husband’s remarkable legacy will forever be associated with the nationally renowned department he has built at Houston Methodist. It also honors their mutual workplace, giving the hospital abundant resources to inspire excellence and innovation in perpetuity. Stanley Hersh Appel was born in 1933 to Russian immigrant parents in Boston. As a young student at Boston Latin School, he was expected to study up to six hours a night. He completed his undergraduate work at Harvard, then attended Harvard Business School. But an epiphany at age 22 changed his course, and he decided to enroll in medical school to study and understand the workings of the human brain. He started at Tufts and earned his medical degree from Columbia College of Physicians and Surgeons, returning to Harvard for a medical internship. Quality and duration of life have improved for ALS patients over the years. Just 15 years ago, ALS patients lived an average of three years. Today, they live five to six years, some longer. Physicians are now able to better control the main clinical problems of ALS patients – breathing difficulties and falling. Dr. Appel has teamed up with Massachusetts General Hospital to study whether altering the immune system can help ALS patients. “We’ve spent many years documenting that the immune system plays a significant role in neurological diseases,” Dr. Appel says. His research team recently took blood from an ALS patient and altered its properties before injecting it back into the patient after a few weeks. “In a mouse model, this dramatically extended its life,” he says. Dr. Appel’s passion for his patients and his vision for the future of ALS research come alive in the ALS Clinic he founded 34 years ago. The MDA/ALS Research and Clinical Center was the first multidisciplinary care center for ALS patients in the country. One Friday a month, patients and their caregivers arrive early – it’s first-come, first-served – and physicians, social workers, dietitians, physical and occupational therapists, volunteer lawyers and accountants come to them. They’re called Team Hope, and they give people as much time as they need, with no direct cost to patients. The Appels are at their best on clinic days, and they wouldn’t miss one. The love and respect they share with these patients is present in their touch, their words and their smiles. Ronald Bess (at right) is a regular patient who comes three to four times annually and has for a decade. The 65-year-old retired refinery worker drives himself 55 miles to be the first one in line. “This gentleman shows that the more positive you are, the more you fight ALS and get on with your living, the better you do,” Dr. Appel says. When the Appels hear that he arrives 45 minutes before the doors open at 6:30 a.m., they promise to put a chair by the elevator before the next clinic. When Joan Appel decided on this gift to name the department in her husband’s honor, Dr. Appel had no idea it was coming. “I’m grateful,” he says, “but whether Stan Appel’s name is on the department is not a key issue. What is most important is that we have a community of dedicated, highly motivated people who want to improve the quality of life for their patients.” Joan’s gift will do just that, by helping to ensure outstanding care and improved treatments in perpetuity through a sustained investment in research, innovation and discovery and by the continued recruitment and retention of leading clinician-scientists in the Appel Department of Neurology. Dr. Appel’s list of accolades is long. He has written 15 books and more than 400 articles, won numerous awards and trained more than 200 neurologists, many of them now heading their own departments. “Stan Appel is among the most preeminent neurologists in the world,” says Houston Methodist Board Member Gary Edwards, whose late mother Sonja was treated by Dr. Appel and whose generous gifts – from Gary, his wife Peggy and their family – endowed the ALS chair that Dr. Appel holds, named the ALS laboratory in his mother’s memory and established the envisioned Center for Neurodegenerative Diseases. “We’re so grateful for the exceptional care he provided to my mother, and my family has been honored to support his work.” Perhaps Dr. Appel’s greatest, most lasting legacy will be his connection with patients and his ongoing quest to improve their lives through research, care and compassion. As many as 70 million Americans suffer from digestive disorders. The Lynda K. and David M. Underwood Center for Digestive Disorders at Houston Methodist is making a concerted effort to remedy this problem. Between 60 and 70 million Americans suffer from digestive disorders. Many of these conditions are highly treatable or curable. Yet, they often go undiagnosed and untreated for one critical reason: People are embarrassed to talk about them, even to a medical professional. Sometimes telling your doctor about digestive disorders is hard to stomach. Dr. Eamonn Quigley, David M. Underwood Chair of Medicine in Digestive Disorders and co-director of the Lynda K. and David M. Underwood Center for Digestive Disorders at Houston Methodist, has spent most of his professional life researching “gut health.” He is the immediate past president of the American College of Gastroenterology. The main message, Dr. Quigley says, is that with early detection, the outlook for these disorders is much improved, and there are many effective therapies now. The Underwood center, funded by a generous gift from David and Lynda Underwood, was launched in May 2013. David Underwood is Houston Methodist’s longest-serving board member, vice chair and longtime chair of the finance committee. His leadership and keen financial stewardship helped establish Houston Methodist as a financially secure, leading academic medical center. David, Lynda and their family have faithfully supported Houston Methodist, giving generously of their time, expertise and philanthropy, most recently to create the Underwood center. Vital to the center’s effectiveness is the patient-focused care, which is done in an environment that fosters education, training and research. Through the Underwood center’s relationship with the Houston Methodist Research Institute, patients can become involved in trials of new therapies and diagnostics. The Underwood center exemplifies Houston Methodist’s core mission of education, research and patient care. “Lynda and I saw a need in our community to provide enhanced care and research in this area, so we’re grateful to have the opportunity to provide such a service in Houston,” says Mr. Underwood, who also serves as chairman of the board of directors for the Texas Medical Center. “PATIENT CARE IS DONE IN AN ENVIRONMENT THAT FOSTERS EDUCATION, TRAINING AND RESEARCH. THROUGH LINKAGE WITH THE RESEARCH INSTITUTE, PATIENTS CAN BECOME INVOLVED IN TRIALS OF NEW THERAPIES AND DIAGNOSTICS. The Underwood center’s integration of specialists -– including gastroenterologists, gastrointestinal and hepatobiliary surgeons, body imaging radiologists and molecular pathologists -– is crucial to effective management of disorders of the digestive system. The center was founded by Dr. Barbara Bass, John F. and Carolyn Bookout Distinguished Endowed Chair of Surgery, and Dr. Richard Robbins, Charles and Anne Duncan Distinguished Endowed Chair in Medicine at Houston Methodist. They in turn recruited Dr. Quigley. The classic example is what happens when we take antibiotics, says Dr. Quigley, and we’re learning more and more about changes in the microbiota that may well play a role in the causation or the continuation of diseases such as colitis, Crohn’s disease, fatty liver and other liver diseases. “It’s not very far away when we will be able to give specific therapies to modulate microbiota, to restore it to ‘normal’ and hopefully alleviate the condition,” he says. Dr. Quigley works with biomarkers to improve diagnosing irritable bowel syndrome. “Right now, the only way we can diagnose irritable bowel syndrome is by excluding other conditions that might cause the same symptoms,” Dr. Quigley says. One of the most controversial areas in the treatment of digestive disorders has been the subtle relationship between psychological and biological conditions. The Underwood center is pursuing an integrative approach to treatment, working in tandem with dietitians from the Houston Methodist Wellness Center as well as evaluating psychological factors. For decades, doctors assumed that disorders originated in the patient’s mental state and then manifested physically. “I want to say very firmly that is not the case. There’s been a major shift away from that idea,” Dr. Quigley explains. He believes that Houston Methodist’s ability to provide comprehensive care makes the Underwood center unique. For more information about the services available at the Underwood center, or to schedule an appointment, call 713.441.9770 or visit houstonmethodist.org/underwood-center . Dr. Veronica Selinko-Curran knows firsthand the importance of translational research. She is a retired breast imaging radiologist who has worked in both academic and private practice. She is also a cancer survivor herself and is very aware of the great importance of translational research. When she and her husband Michael Curran learned about Houston Methodist’s TRI, they became instant advocates. She agreed to help by leveraging her considerable medical background to coach physicians on their presentations, helping them edit out medicalese and speak so that lay audiences can understand. “Most doctors are so involved in their patient care and research that making presentations is low on their list,” she says. Last spring, the couple hosted a TRI reception in their home, introducing their friends to Houston Methodist physicians Dr. Jenny Chang, director of the Houston Methodist Cancer Center; Dr. R. Mark Ghobrial, director of the Sherrie and Alan Conover Center for Liver Disease & Transplantation; and Dr. Joseph Masdeu, director of the Nantz National Alzheimer Center. Their reception helped inspire additional TRI Founding Members. Dr. Selinko-Curran says she has found a good niche in TRI, one that allows her to be productive and give back to the world, but also one that enables her to continue to learn daily. If an octopus loses an arm, the tentacle will grow back, or “regenerate.” Today, researchers at Houston Methodist Research Institute are discovering regenerative treatments to bring patients new hope for healing. The ideas sound like the stuff of a science fiction movie: • A hydrogel that can be injected into an injured spine to regenerate bone tissue, similar to the way a salamander grows a new tail or a starfish grows a new arm. • The use of “nanoscaffolds” –- imagine Russian nesting dolls made up of tiny nanoparticles, one inside the other –- to allow the reconstruction and recovery of nerve connections from the spinal cord to urological functions. • A computerized exoskeleton that allows paraplegics to stand up and walk while directing the computer with their brain waves. It is the Neuroregenerative Medicine Program and the Regenerative Medicine Program at Houston Methodist Research Institute. And the time frame is not centuries in the future, but now, or very soon. Dr. Grossman says the timing is right for other reasons as well. “The tremendous growth of computer programming, with the miniaturization of electronics, and the development of molecular biology allow us to have a much better understanding of the structure and chemistry of the nervous system.” The Neuroregenerative Medicine Program links three complementary components: spinal cord injury and other neurological disorders; urological (bladder and kidney) dysfunction; and biomaterials engineering and stem cell technology. Dr. Grossman is joined by colleagues Dr. Timothy Boone, chair of the Department of Urology at Houston Methodist, and Dr. Ennio Tasciotti, associate member, Houston Methodist Research Institute, and co-chair, Department of Nanomedicine. “Neuroregeneration implies that there is some damage or injury to the nervous system that needs to be repaired,” says Dr. Boone. “The best forms of repair are inherent to your own body.” Many things stand in the way of that normal repair mechanism, Dr. Boone says. It’s particularly difficult in the nervous system, because the cells are less apt to regenerate centrally than they are peripherally. “Regenerative medicine is trying to understand the natural processes and the barriers to natural recovery, and based on those two factors, figure out a way to facilitate the natural repair by dealing with the barriers,” he explains. The program’s specific focus involves the use of nanotechnology-– nanoparticles are, in effect, a bridge between bulk materials and molecular structures-–for spinal cord repair and bladder reconstruction after a spinal cord injury (SCI). It is difficult to overstate the trauma that follows an injury to the spinal cord. SCI often results in the loss of everyday neurological functions, causing varying degrees of motor, sensory, bowel, bladder and sexual dysfunction. The adjustment to this stark new reality brings with it a barrage of physical and emotional challenges. “I think it will be a major step forward in clinical trials involving the injection of stem cells into the spinal cord,” he says. “You have to have an atlas to know the exact position of where to inject, and how deep you should go. Dr. Tasciotti, in whose spinal technology lab the clinical trials are taking place, says he is optimistic about the time it will take for nanomedicine treatments to progress from the bench to the bedside. “Nanomedicine is the application of nanotechnology to the biomedical arena, to problems that we couldn’t find solutions for with current techniques, whether they are pharmacological or surgical,” Dr. Tasciotti says. In 2007, Dr. Eugene Alford, a respected surgeon at Houston Methodist, was clearing brush on his family’s ranch in Bellville, Texas, when a dead tree fell on him, resulting in a severe spinal cord injury. After months of intensive therapy, he eventually recovered well enough to use a wheelchair and resume his surgical practice, but his legs were permanently paralyzed. Five years later, Dr. Alford walked into a room full of doctors and scientists at the Houston Methodist Research Institute. He is still paralyzed from the waist down, but he is able to stand upright and move with the help of Rex, a robotic exoskeleton that relies on an external brainwave/ machine interface. In other words, Dr. Alford thinks about moving, and Rex moves. Rex is the result of a partnership between Houston Methodist Research Institute’s Neuroregenerative Medicine Research Program, under the direction of Dr. Robert Grossman, and University of Houston computer engineering professor Jose Contreras-Vidal, PhD. It takes its name from its manufacturer, Rex Bionics of New Zealand. “Dr. Contreras is leaps and bounds ahead of what they are doing in surgery,” says Dr. Alford. Houston Methodist recently purchased the latest version, nicknamed NeuroRex, with the support of a grant from TIRR Foundation. “This version has integrated circuitry that makes it possible to communicate with our brain-machine interface (BMI) system based on a high-density scalp electroencephalogram (EEG),” says Dr. Contreras.